WHERE TO USE IT: In closets, around furniture, by important fabric, around windows or any place where you have either seen activity or don't want to have any activity. RATE OF APPLICATION: Try to set at least one out in every room where you want to protect furniture or fabric; more if there is a lot of activity present. 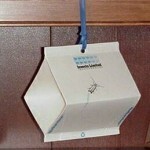 The general rule to follow is to have one trap for every 100-200 sq/ft of room space. 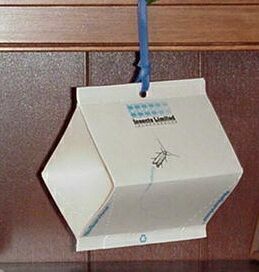 Since these traps work by releasing pheromones, the higher up they are located the better results you will get. Good product. First time buying this trap…support was VERY helpful and answered my questions via email right away so that was awesome! The traps work as advertised since I placed the pheromone bait and immediately saw those beetles being drawn into them. Somewhat disappointed that the trap I hung in one room didn't get hardly any beetles, the one I set on the floor is doing a great job. Overall, great product and worked as advertised for me. Great product and service! This is the 2nd time I purchased this item and I had the same great experience with the order as I did previously. The traps already started catching cigarette beetles from day 2. Shipping was quick and customer service is always willing to answer questions. Would certainly purchase this and other products from this site in the future.